Admittedly, the VMWare Workstation Unrecoverable Error (vcpu-0) is probably not the hottest or most sought-after topic I could write about today. The number of people who would potentially be helped with this is going to be substantially smaller than the number of folks who are interested in revealing passwords behind the bullets or even customizing the Windows 10 start menu. Yet I do feel the motivation to publish this article anyway. Why? Because when I encountered this VMWare error myself there wasn’t much information out there that explained how to deal with this problem. Which is pretty strange when you think of it, because the solution is pretty simple. It took me quite a while to figure it out, but when I finally did I decided to publish my findings on my website with the hopes that it helps someone else. I first started experiencing the error with VMWare Workstation version 11 on a Windows 10 64 bit host platform, running another 64 bit Windows 10 version as guest operating system, but I guess the error is not limited to this combination of versions only. And then a few more lines of text. Here’s a screenshot of the error message. If the above information corresponds to the error message you are seeing on your system, you’ll most probably be able to solve your issue with the same workaround I used. The issue seems to originate from the fact that recent builds of Windows 10 will sometimes use S.M.A.R.T. 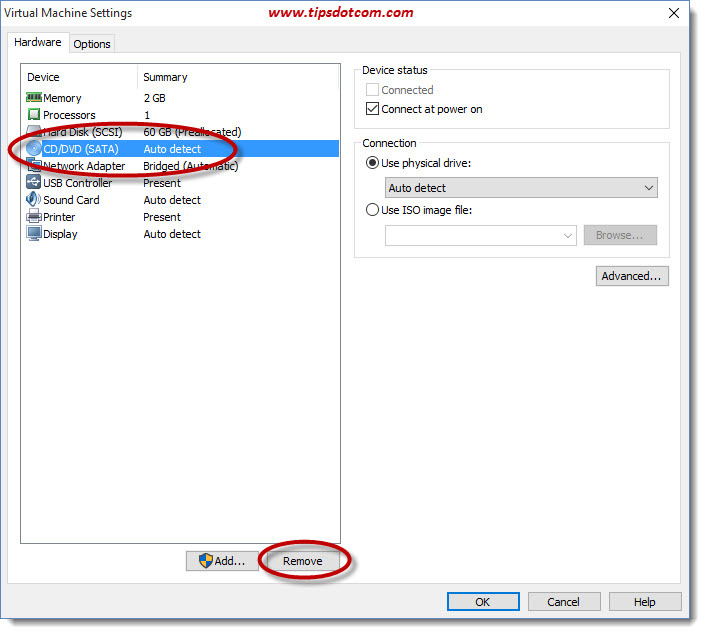 commands for certain SATA devices, even when the devices (in your virtual machine) report that they are not S.M.A.R.T. devices. VMWare has announced a fix for this, which will basically ignore S.M.A.R.T. commands when used in conjunction with non-S.M.A.R.T. devices in your virtual machine. You can download and install the fix in order to solve the problem. Or, and this is probably a much quicker fix, you can look for any SATA CD/DVD devices in your virtual machine settings and disable these to prevent the error from happening. The VMWare virtual machine settings screen in the image below shows how the CD/DVD device is indeed a SATA device (hence the “SATA” between the brackets in the device list), whereas the hard drives are usually SCSI devices by default in VMWare. 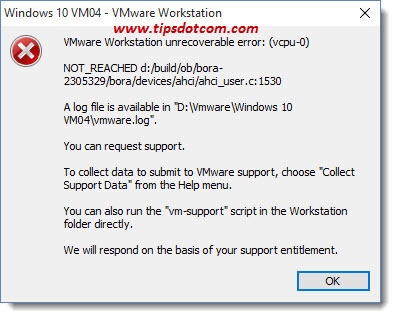 If you don’t need your physical CD/DVD drive all that much in your virtual machine, you can easily remove the device and you’ll never see the VMWare Workstation Unrecoverable Error again. Of course, in order to change your virtual machine settings and remove the CD/DVDROM, you’ll need to shut down your virtual machine first. It also has to be noted that, WITH the CD/DVDROM present in your virtual machine, your virtual computer will generally run just fine for multiple hours in a stretch before the error crashes your machine. So in case you should need your CD/DVD drive again to install software or for other purposes, you can easily add this device again in your virtual machine settings window, use it while it’s there and then remove it again once its job is complete. Feel free to also check out my other VMware article: Fixing VMware locked file issues.